By exploring themes of fragility, mobility and turmoil, anxieties and agency, and pedagogy, this book shows how colonialism shaped postcolonial projects in South and Southeast Asia including India, Pakistan, Burma, and Indonesia. Its chapters unearth the contingency and contention that accompanied the establishment of nation-states and their claim to be decolonized heirs. The book places key postcolonial moments - a struggle for citizenship, anxious constitution making, mass education and land reform - against the aftermath of the Second World War and within a global framework, relating them to the global transformation in political geography from empire to nation. The chapters analyse how futures and ideals envisioned by anticolonial activists were made reality, whilst others were discarded. 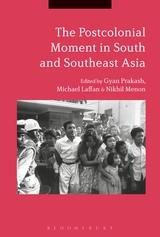 Drawing on the expertise of eminent contributors, The Postcolonial Moment in South and Southeast Asia represents the most ground-breaking research on the region.